Use the proper footwear that can provide some slip resistance and traction. Take short steps or shuffle, and try to ensure your torso stays balanced over your feet. Keep your hands out of your pockets. 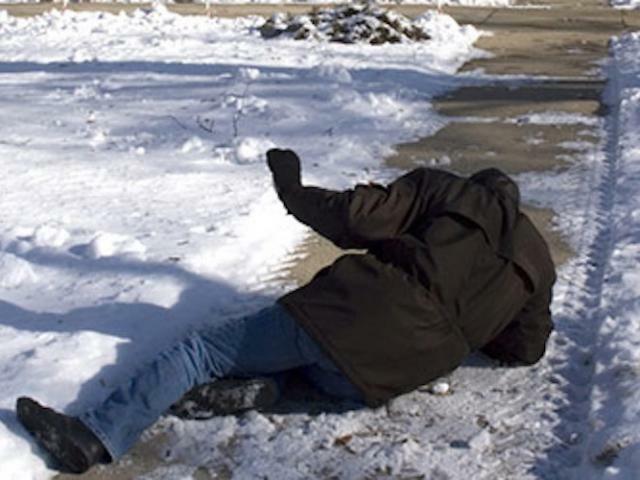 You can help break your fall with your hands free if you do start to slip and by placing your arms out to your side can help to maintain your balance. Utilize handrails and grab bars, or follow a fence line in an effort to maintain your stability by holding on to a solid object. If applying salt to travel paths is not an option, apply sand, gravel, kitty liter, floor dry or some abrasive substance to provide a texture for traction. Use grassy areas as a secondary travel path. This will provide a course texture to increase traction while walking. Take extra precaution around livestock watering areas. Ice can form in theses areas by water being splashed or dripped around the perimeter of the tank. When transitioning from the bright outdoor environment to indoor areas, stop briefly to allow your vision to catch up with the change in lighting, in order to recognize hazards ahead. Use 3 points of contact when mounting or dismounting large equipment (1 hand / 2 feet) or (2 hands / 1 foot). Ensure there is solid footing on the ground before final dismounting. For more information about OSU Ag Safety visit http://www.agsafety.osu.edu or contact Kent McGuire, OSU Agricultural Safety & Health, at mcguire.225@osu.edu or 614-292-0588.